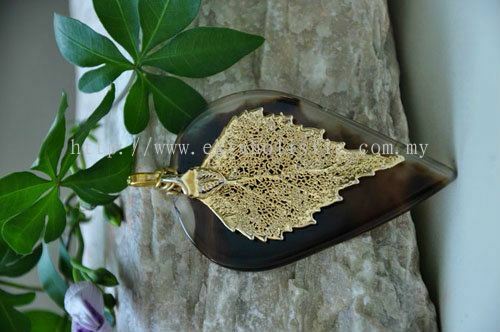 Uniquely design, this delicately carved Leaf Pendant comes with 14K Gold Plated Leaf and the golden-brownish leaf made of Agate, strung on a golden plated brass bail. Fine quality, smooth edges, just lovely… Urging people to protect the nature, love the nature. It is truly unique. This leaf pendant will bring eternal blessings to you. We know you will love this beautiful pendant. Leaf symbolizes Truth & Honesty. It also represents happiness, faith and endurance. 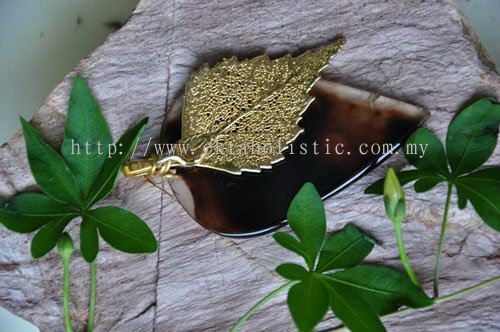 This leaf pendant will bring Eternal Blessings to you. Agate is a stone where everyone should have as protection. It has been used as a protection gemstone over many years in history. It protects one from stress and energy drain, and also bad dreams. It is one of the oldest gemstones in recorded history. Agate does not change your emotions, but it heightens your level of acceptance of the emotions. For instance, when you are feeling very sad, the Agate gives you the strength you need to carry on. It will let you know that this will pass and help you to get over. It absorbs negative radiations, ideal for office or study. It is a good stone for those who involved in numbers, calculations and statistics, like bankers, accountants... It helps one to become more precise. Physically, it can heal stomach upsets. It protects from fevers, aids in insomnia, skin diseases, good for digestion, lymphatic and circulatory systems.